Cutting: An enjoyable wine with plum, raspberry, vanilla and spice characteristics. The Rosenblum Richard Sauret Vineyard Reserve Zinfandel from Paso Robles is an enjoyable wine with lovely plum, raspberry, vanilla and spice aromas and flavors. 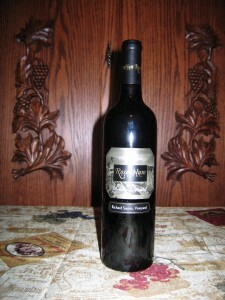 Some Zinfanatics noted cherry and blackberry characteristics in this medium to heavy bodied wine with a relatively long finish. One taster detected musty, barnyard aromas. All our Zinfanatics liked this wine although no one ranked it in the top two.